This genuine Samsung Aqua-Pure Plus DA29-00003G is the latest upgraded water filter to fit Samsung American style side-by-side fridge freezers with and internal water filter. The Samsung DA29-00003G should be replaced when the filter indicator light turns red, every 6 months or if you notice a decrease in flow of water. When the water filter is replaced, reset the indicator by pressing the Ice Type button and the Child Lock button simultaneously for 3 seconds or by pressing only the Ice Type button for 3 seconds. Samsung: DA29-00003G, DA29-00003A, DA29-00003A-B, DA29-00003B, DA2900003A-B, DA2900003A, DA29-00003, DA61-00159, DA61-00159A, DA61-00159A-B, TADA29-00003B, TADA29-00003A, DA97-06317A, HAFIN2 EXP, HAFCU1, HAFCU1/XAA. 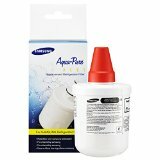 This FilterLogic Samsung compatible DA29-00003G water filter to fit Samsung American style side-by-side fridge freezers with an internal water filter. 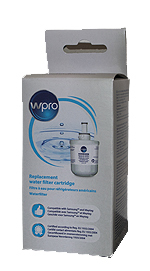 The FilterLogic FFL-180S should be replaced when the filter indicator light turns red, every 6 months or if you notice a decrease in flow of water. The Omnipure can be used to replace all in-line fridge water filters where an external water filter kit is fitted, with push fit fittings. The Omnipure K-Series is a superior granulated carbon filter with easy push fit connections that take a 1/4" pipe and 1500 gallon/12 month life, which ever is sooner.